I’ve always known that bargains are everywhere but you have to go looking for them. That was so true last week. During my trip to the supermarket I was in the produce section and was just about to head over to the bulk bins when I pushed the cart by a display of bottles. Attached to the display was a notice with 91 cents written on it. As most of the time that’s the discount price I didn’t pay much attention. But then I noticed that was the price of the item and it was something I’d bought during the holidays for $2.79, bottles of sparkling organic apple juice. 91 cents a bottle and imagine my surprise when I noticed the display was full. Were people insane for passing by such a bargain and not grabbing a few I asked myself? I thought about filling my cart with bottles but settled on just five. Lesson learned here, pay full attention in every store because you never know where a bargain will show up. I’m calling this buy, my bargain of the week. Last week I also took a trip to one of my favorite stores, Trader Joe’s. I just like browsing to see what’s new and yes, looking for some good buys. I can always count on that store for netting me some bargain items. This time it was the green beans and edamame. 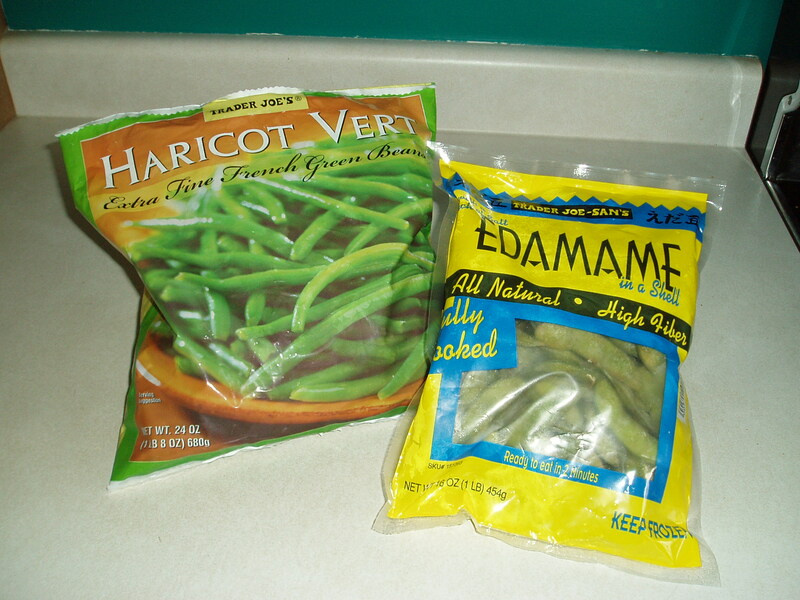 The green beans cost just $1.99 and the edamame $3.38, both of which I’ve bought before and enjoyed. And if you’re ever looking for a healthy snack that doesn’t cost much and fills you up, try edamames. I didn’t think I’d like them, but they’re great with just a little salt and pepper. Remember there is still time to enter the Walmart Valentine’s Day Gift Giveaway. A winner will be picked and announced on Wednesday (February 10th) afternoon so be sure to leave a comment by 12 noon Eastern time for your chance to win. This week on Budget Smart Girl, some budget friendly ideas for Valentine’s Day. Plus, one of the best ways to give budget foods some pizzazz is to use herbs and spices. The Spice Hunter has some great ideas and spice suggestions for you. First of all hello and welcome to all the new visitors to the site and also to everyone who signed up for the newsletter. We’re growing in numbers every week. Last week was a good one for receiving free, well, almost free items. I’d sent for the Sudoku game that Gorton’s were promoting. Can’t remember how many UPC I had to send (I think it was 3) along with $1.99 to receive this game. Just the right size for carrying in your purse if you have to wait at the doctor or dentist’s office. These are also good things to collect throughout the year for stocking stuffers. And when I ordered my Aerogarden there was an offer for a cooking DVD and four chopping mats for $4.99. They must have run out of them because here’s what they sent instead. The cookbook has some great recipes and I can’t wait to try this marinade maker when the herbs are harvested. Oh, and speaking of my Aerogarden, I also sent off for a $10 rebate they’re offering until the end of the year. That brings down the price I paid down to $69.99. And to finish off my week of bargains, I used all $1 coupons at the supermarket and saved $20 off last week’s bill. This week on Budget Smart Girl. The first annual BSG Valentine’s Gift Guide. And we’ll hear from the Frugal Foodie who has lots of tips and a great recipe to share.